Ant Troopers are ant enemies debuting in Super Mario 3D World. They are indigo-colored and have a pair of antennae, a striped body, yellow eyes, red feet, and an overbite. Ant Troopers make their first appearance in Super Mario 3D World. 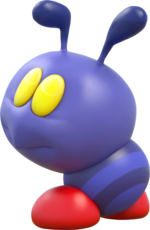 They appear uncommonly throughout the game, and are introduced in World 4-1, Ant Trooper Hill. They attack by marching, sometimes emerging from holes or pipes, and keep walking on walls. They cannot be defeated by jumping, but are vulnerable to Ground Pounds, Cat Mario's and Tanooki Mario's attacks, and projectiles as well. Ant Troopers sometimes carry items on their backs, mainly coins and Super Bells. Big Ant Troopers are an Ant Trooper subspecies. As their name implies, they are larger than common Ant Troopers, and are also rarer. These can't be defeated by any attack. Horned Ant Troopers are basically Ant Troopers wearing an orange helmet with a spike over their body. The helmets prevent their heads from being stomped, making them very similar to Spike Tops, but only if the helmet is facing upward; if they are walking along a vertical surface, they become safe to jump on. Ant Troopers appear as course elements in Super Mario Maker 2 in the Super Mario 3D World level style. Ant Troopers return in Captain Toad: Treasure Tracker, behaving like they do in Super Mario 3D World. While interacting with them using the pointer or touch screen, they do not stop like regular enemies. If pointed at for enough time, they reward the player with one coin. In Mario & Luigi: Paper Jam, Ant Troopers appear alongside Horned Ant Troopers in battle in the Twinsy Tropics Dungeon. If Horned Ant Troopers take enough damage, they lose their spike helmets, turning them into normal Ant Troopers and lowering their defense. While in this state, they attack the Mario Bros. by dashing into them instead. In Mario Tennis Aces, Ant Troopers appear as spectators in Bask Ruins. This page was last edited on March 26, 2019, at 00:20.